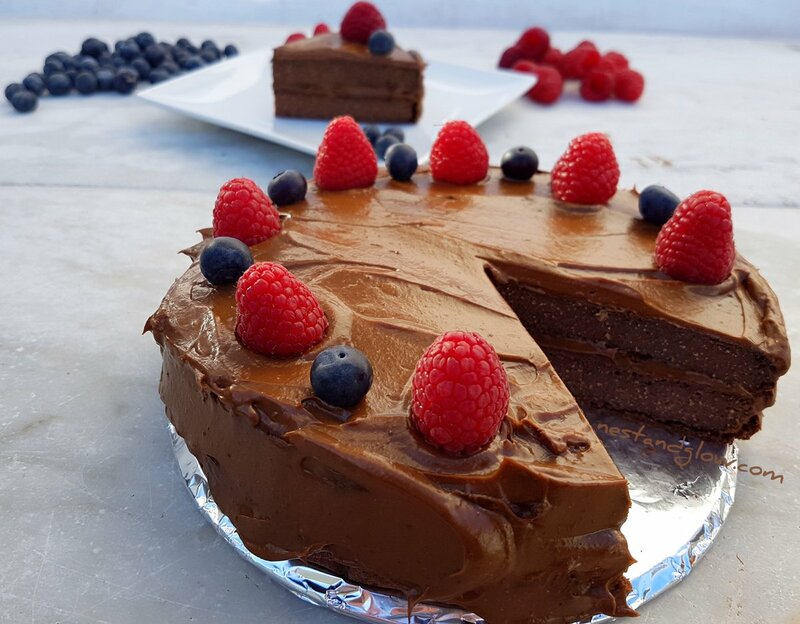 Healthy quinoa chocolate cake that’s vegan, eggless and refined sugar free. If you’re cooking this quinoa cake for a sceptic just call it chocolate fudge cake. 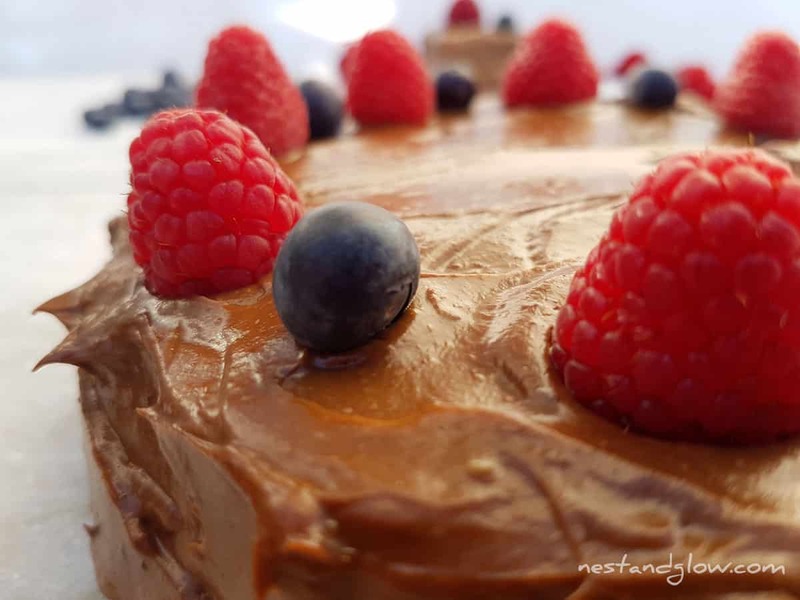 They may guess it is gluten free as its heavier than a traditional cake but they are unlikely to guess it’s bursting with nutrition and good for you. Iced with a healthy chocolate avocado frosting. It’s moist and deliciously stodgy so a small slice is very filling. Suitable for gluten-free, refined sugar-free, vegan, plant-based, paleo and general healthy diets. This gluten-free quinoa cake recipe has been in development for a while. I’ve been working on it since making quinoa pizza bases and chocolate avocado mousse and this is a hybrid of them together. What can be better than a cake made from high protein quinoa and heart-healthy avocado? No oil, flour, gluten, stabilisers eggs or butter in sight. This quinoa cake is just under half raw, so great if you are trying to eat a diet high in raw foods. You can grease your pan with some coconut oil if you prefer and it will give a sharper edge to the chocolate cake. As I’m filming this recipe I want to guarantee it will come out of the pan easily so used parchment paper. The rough edges don’t matter as it’s being iced. Make this a triple chocolate quinoa cake by adding a handful of chocolate chunks to the cake batter before baking. This recipe uses dates as the sweetener for the base they can vary in sweetness significantly. I used very sweet fudgy dates so If you use less sweet dates or want a sweeter cake then add some maple or other syrup to the cake bases. To make without dates just use another dried fruit or natural sweetener. Try a tiny bit of the cake before icing and if it’s too bitter for your taste add some extra sweetener to the icing or brush on top. The cake is gluten-free without any stabilisers it will only get a small lift in the oven. It’s a dense but moist and delicious cake. One slice contains a huge amount of nutrition from the quinoa, avocados, dates, cocoa and chia. Soaking the quinoa is needed to make the seed easier for the body to absorb and easier to blend. When you soak the seeds they start to grow and it’s said the vitamins and minerals are more bio-available. As the quinoa is soaked this chocolate quinoa cake is paleo friendly. When blending the healthy cake batter you will probably want to do it in two batches if you have a small blender. The quinoa and dates are hard so you don’t want to be putting too much stress on your blender as it may cause damage. Even if you are using pitted dates do still check that no stones are left in as even just a fragment can ruin the whole cake. A 600w small jug type blender is powerful enough to make this. Most quinoa is pre-rinsed in the UK so you don’t get a bitter taste. If the quinoa you use can sometimes be bitter do rinse the grain thoroughly before blending to remove any quinoa bitterness. Fruit for decoration, any bright berries are good – raspberries, Inca or strawberries. Also chunks of dark chocolate or cacao nibs work great on this quinoa cake to give a deep rich chocolate flavour. Soak the quinoa for at least 15 mins, then drain. Soaking for an hour or overnight is preferable. Add everything else for the batter into the blender and blend until smooth. Split into two lined 6″ pans and bake for 35-45 mins at 180 C / 350 F.
You can tell when it’s cooked when a knife comes out clean. Leave to cool for 15m before taking out of the pan. Blend all of the icing ingredients together. Ice the top of one cake, place the other cake on then ice the top and sides. Decorate with berries, store in the fridge and enjoy within 3 days. I made it. Turned out a little bit like a quinoa cocoa pudding sort of thing – my food processor didn’t chop the quinoa very much. I would double the frosting and make it a bit sweeter. I will try to make it out of raw buckwheat instead of quinoa next, sounds promising to me:). Hello, sadly I don’t think a food processor will blend the quinoa smooth enough – it really needs to be a liquidiser. But a small 600w one is good enough, but will need to be done in batches. You’re right that buckwheat is much softer and a food processor will break that down. If you do have a blender I would recommend to try the original recipe. Hy, thank y for recipe! But my cake went too bitter, what did I do wrong? ???????? This turned out really well, I added 2 table spoons of maple into the cake batter and it was just right for the children and 6 table spoons in the frosting. It’s a bit flatter than I expected, but that often seems to be the way of gluten free baking but my body feels much better giving up gluten and normal sugar. Do you think it would work with buckwheat groats as well? Instead of quinoa, so much cheaper. I just copy and paste onto a text doc. This is a great recipe, I added honey to the base and used honey for the icing and it turned out great. Was diffcult to tell when it was cooked and I thought that I overbaked it and it would be dry – But it turned out perfect 🙂 Not much lift but nevermind its the best gluten free chocolate cake I’ve made so far. So soaking it for at least 15 min as you mentioned it wouldn’t have worked better! Its a shame because otherwise would have been a nice cake..
hi! going to try this recipe this week for an event. do you think it would taste better the same day or kept in the fridge and eaten the day after? thanks! Hi, I wouldn’t advise that as its good to soak and sprout the quinoa. I’ve not used the flour but I imagine it will work, but you will probably need to add more water. Let me know how you get on. Hello, just wondering for health purposes how many carbs are in this cake? Thankyou! Hi, I have a question – what size pans do I need to use – 6″ as the Method explanation says or 8″ as shown at the video? Thanks! Honey is actually plant based from the pollen of the flower. The bees just process it a bit. Just say’n. What funny timing, I’ve just published an article on plant based and vegan I had always assumed that everything concerning food that was plant based is vegan, didn’t think of honey. I wonder if its a grey area for people that are plant based and not vegan? I made this as my birthday cake on Tuesday and it was amazing!!! Everyone loved it, had to stop my other half (who is a non vegan, junk eater) consuming the whole thing. I love the raised eyebrows when they ask what it is made of first, then they tried it and loved it. You can see a picture of it over on my Instagram @psoriasisbuddy. It was like the thickest most satisfying double brownie and chocolate pudding concoction ever. I am now truly hooked on your website and it has a firm place in my favourites on my browser. When I make this cake again (and I will!) I might try adding mint to it as chocolate and mint is a big addiction of mine. Oh and one with chilli! Hi, I want to try this recipe, but Im not sure i can finde dates where I live, what can I use as substitute?? And these values are for the whole cake or just one slice? 🙂 thanks! If you download the Printfriendly app, you can always print just the contents of a page and not all the stuff around it. You also get the option to remove images if you’re saving on coloured ink. Hello Tricia, the written recipe says this – it’s the second ingredient on the list. Is it showing for you? I am making this tomorrow … I was thinking of putting it into a cake baking pan 9 x12 x 2 and then cutting the cake in half and icing the square cake … any comments or concerns would be appreciated … 350 for the same time or perhaps 60 minutes? Also what about doubling the recipe and putting it in a 10 x 15 x 2 cake baking pan? these baking pans I have are professional series sheet cake pans with safe anodized seal … any comments? should I cook the quinoa first? doesn’t really say how to add it in the recipe or if you should cook it hummm? I had the same confusion about the water added – because the recipe makes it sound like the water is used for soaking and then discarded… but clearly it needs the water to mixup! Plan on making this a regular recipe – really delicious!!! Thanks so much for posting it!! Hello, I am going to attempt to make this cake, only thing is, can it be frozen? What can I use instead of avocados? Hi Vlad, You could use a banana in its place. Some people on social media have done that for this recipe. Or you could use any of the non avocado frostings in my other cakes. 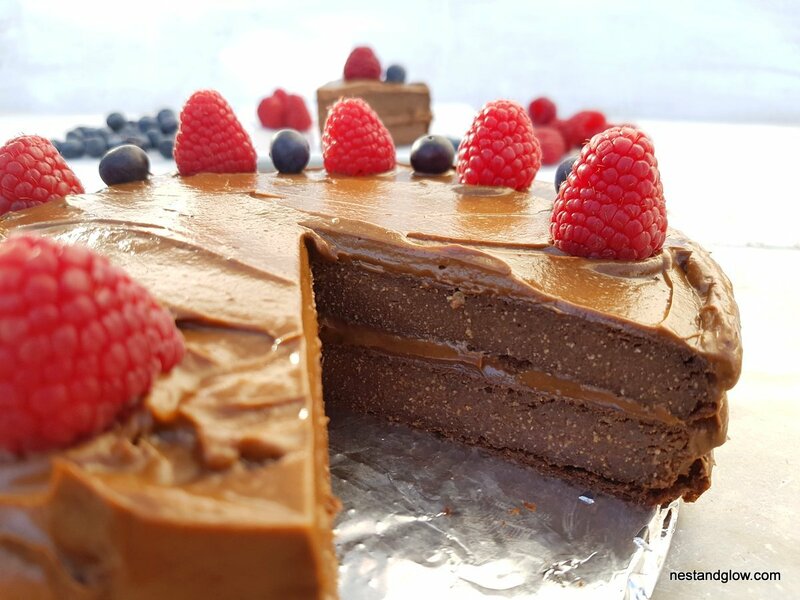 This is my favorite vegan healthy chocolate cake! I’ve made it at least a dozen times and love it. So rich one cake will last me for a couple of days and is a healthy meal on its own. I’ve ordered your book and can’t wait to get it! Wow thanks so much that’s great to hear and hope you like the cook book as much as I do!